Tonight I had a fairly interesting evening, enjoying a few quiet beers at the Rose and Crown pub, then chatting with the friendly valet at the Westin hotel who was ever so eager to turn up the heat for me in the vestibule because I “must” be cold (but in fact I was on a fast melt thanks to my hormonal driven overheating internal combustible engine, but didn’t have the heart to tell him), followed by a dinner full of belly laughs and shouting at the hockey game, at Route 99 with hubby and an assortment of other humanity from in and around Old Strathcona. I love the diversity of my neighbourhood. In one booth, I was observing a couple salting and re-salting their plain lettuce greens, and in another, a bunch of people that looked like, well, the sort you don’t look at too long without causing trouble. I decided on a plate of onion rings, which, in my world, Route 99 does the best in the city. 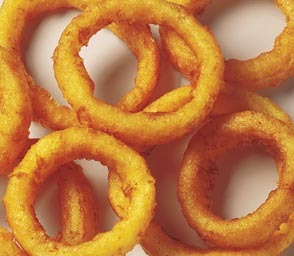 Old school, plain and simple onion rings. The only onion ring I’ve eaten that trumped this, was the one made by the gang at Ernest’s when David Adjey was in town and a few of us foodies were invited to meet him. But of course, this was a “fancy” onion ring event, so were only served one. Unlike tonight, where the plate was full to overflowing and had more than enough to share with all and sundry. I’ve recently joined another wine club, and admit I can be snobby about wine every now and then, but tonight with my onion rings, I had two choices for wine: Red or White. I chose the red, which came out of a box, the glass filled to the brim, and it was quite possibly the best glass of wine I’ve ever had. As I keep saying to those who will listen, it’s not really about the food or the wine. It’s about the company you keep. And that my friends, is all that matters. oh REALLY?!?!? The best you’ve ever had? Glad to hear it!! I bet you’ll write those words again, regarding a glass of red wine!! Red+onion rings=????? Inquiring minds WANT to know! I have a very flexible palate Peter Martin. Onion rings go quite well with red wine thank you very much. Especially when you’ve had two pints of beer beforehand to prepare, erm, perhaps dull, the taste buds. And truth be told, except for one Malbec I bought that tasted of what I think fresh manure might taste like, which also had chewy floating chunks of something funky in it, (which I promptly returned to the wine store and was happily exchanged for my newest love the Tempranillo), I haven’t met a red wine I haven’t liked yet. PS – Your Oiler’s better pick up their socks. Sometimes I just needs me a big ol’ plate of greasy onion rings. Thanks for reminding me of Route 99. I haven’t been there in years. Time to go again!